With its delicate slightly minty flavor, it’s no wonder why it is a key ingredient in the classic French herb blend herbes de Provence. The aromatic flavor is un-be-leaf-able in soups, stews, marinades, salads! Sold at the peak of freshness. 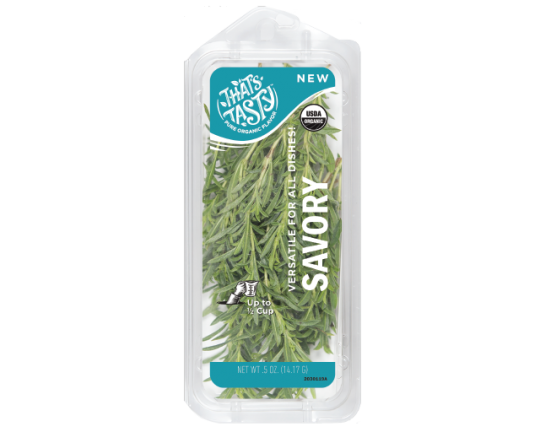 Our Savory is grown and sold to be used right away for the best flavor. Triple the amount you would use for dry herbs and add just before serving. Savory is happiest inside its package, hanging out in your refrigerator drawer. Have extra savory? No problem. Try these fresh ideas for how to use it quickly. Freeze a fresh marinade to use for grilled vegetables or fish. Freeze pureed savory, lemon juice, and garlic in ice cube trays with a little olive oil. These little favor bombs are perfect to quickly add flavor to your meat and vegetables. Freeze pureed savory in ice cube trays with a little olive oil. These little favor bombs are perfect to quickly add flavor to a roast, chicken or vegetables. Just drop a few in the pan before you roast or cook in the crockpot.